Here’s to the crazy ones – the startup founders and their teams. I respect the hell out of you. I don’t envy you in the least. I’ve been there. I was employee six at a software startup that grew to two dozen before we were acquired in 2013. I did the 12-hour days, the six-day weeks. I rode the rollercoaster of product launches, customer contracts, and investor checks. I’ve been an independent marketing consultant for almost three years now. I used to think I’d go back to “do another one” someday. I even had an opportunity a few months ago to join one of our most promising startups. It took me about 30 minutes to turn down the offer. It’s just not for me anymore. You people kray. So, here’s to the crazy ones. In the last few months, I’ve sat at a table with a startup founder who just couldn’t find a way out of her biggest challenge. She was stuck. She threw her hands up. She didn’t know what to do next. Unfortunately, neither did I. All I could say was I’m sorry. I feel ya. I wish it wasn’t the way it is. Then, the moment passed and it was back to business, grinding to find the answer. I’ve watched as another founder signed her first few customers, graduated from her MVP, and closed real funding. After two years of consulting with her, I felt pride in the success. But it wasn’t my baby. In fact, the funding meant hiring and the hiring meant the consultant was replaced. Good luck to you! I’m on to the next gig. The lows are low. The highs are high. When you’re part of a founding team, there are no two-week’s notices. No quitting when things get tough. No leaving early when someone else is working late. In a startup, nobody sits until everyone hits. Besides, I’m not a visionary. I’m a builder. I don’t have a dream. I want to help you reach yours. 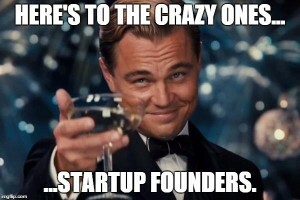 So, here’s to the crazy ones – the startup founders and their teams. May you find the grinders, the customers, and the funding you need to reach for your dream. And, when you do, I’d love to help you reach for it. Part-time. From the outside. No strings attached. Ten weeks after wrapping the inaugural Phoenix Startup Week, more than 200 attendees – and a few noobs – gathered for a reunion over happy hour this month. The reunion was not organized by the Startup Week steering committee. It was grassroots. Robert Backie, Matt Rowley, and Ryan Smith loved Startup Week so much that they ideated, planned, and executed the reunion themselves. They’d never met before Startup Week. Now that’s powerful! No wonder people keep asking if we’ll be back next year. 1. 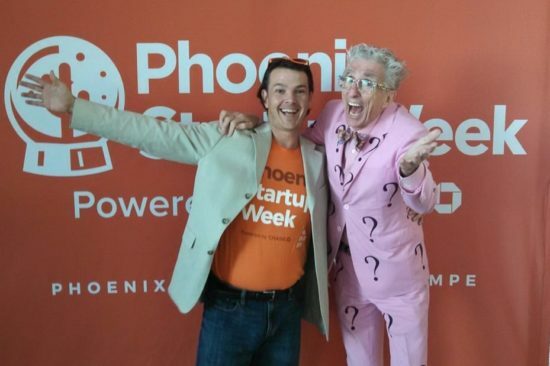 Will Phoenix Startup Week happen again? Yes! We’ve already locked in the week of February 22 for our return. As organizers, our focus will be on creating a repeatable, sustainable event that can outlive involvement from our current team, venues, and sponsors. For attendees, it’ll be bigger and better than before! One of the unique parts of our startup landscape is that it’s spread out across a sprawling metro area. In 2015, we took basecamp to the people, shifting from Phoenix to Scottsdale to Tempe and back again. In 2016, we’ll spread even wider with new basecamp locations already secured in the west and southeast Valley. 2. How can we carry the momentum forward in the meantime? Startup Week is just a week, but the momentum continues under the #yesphx banner – on Facebook, on Twitter, and over beers or cups of coffee across our region. We’re using #yesphx to collaborate and to shift the narrative about Phoenix’s startup scene. Historically, we’ve focused on the challenges we have as a community, including lack of enthusiasm for entrepreneurism. Two-thousand Startup Week participants would argue that narrative is just plain wrong. Sure, there are some things that can be improved – and they are improving – but we use #yesphx to focus on the good. There’s a lot of it! Once everyone gets back from their summer vacations, we’ll start planning our next Startup Week. We’ll definitely need volunteers. It’s all about inclusivity, so sign up for the email list and you’ll be invited to the table. 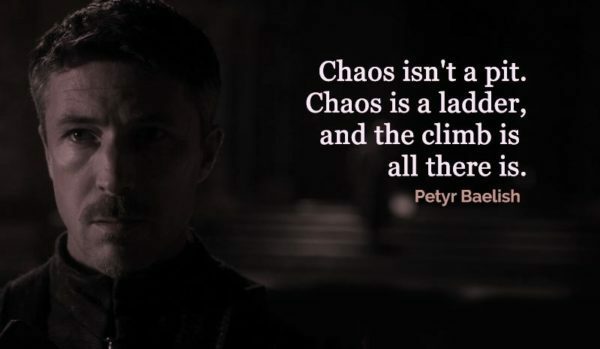 Until then, get involved by communicating and giving to the ecosystem. Engage in the Facebook group and with the #yesphx hashtag. And give without the expectation of receiving anything in return. As Jonathan says, let’s embody generosity. Let’s be the most generous and accessible community for entrepreneurship in the nation – giving of our time, help, advice, money, relationships, and whatever else we have to offer. Two-hundred people at a startup happy hour is quite a turnout for the Valley. We hope to top that when we meet again on June 10. RSVP here to keep up to date. We obviously love happy hours, but we don’t want to supplant the many organizations already doing great work and putting on great events in Arizona. Instead, we want to funnel folks to organizations like Arizona Tech Council, Invest Southwest, and Startup Grind. So check ‘em out. And while you’re out there, spread the word about #yesphx. Give your time to your fellow entrepreneurs. And let’s all come back together for Startup Week in February to celebrate entrepreneurship in Arizona! Over the last year, I’ve fallen in love with marketing automation. It appeals to my past as a writer and storyteller, an email marketer, and a sales enabler. And I love how effective it is! I recently attended a three-day Infusionsoft University training event. Early on, the facilitator pointed out that 80 percent of deals require at least five touches to close. But only 10 percent of companies make five touches. I imagine the percentage is even lower for busy startups! Tools like Infusionsoft make it easier to add touches by automating lifecycle marketing. 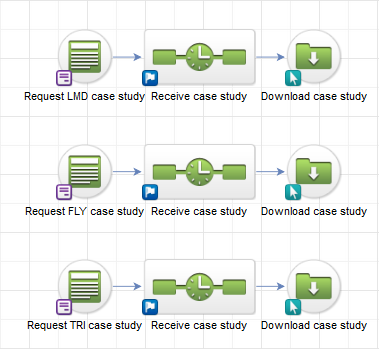 At a minimum, Infusionsoft recommends three types of marketing automation sequences. I’ve implemented each of these sequence types for my client Iris, a startup developing PR management software. I’ll use my work with Iris as the examples here. 1. Lead capture. Iris’ primary capture mechanism lets web visitors book a demo by selecting a time directly from our sales rep’s calendar. This is done with Infusionsoft plugin AppointmentCore. The meeting is added to the rep’s calendar, GoToMeeting info is distributed, and reminder emails are sent … automatically. No back and forth on availability required. Someday soon, we’ll add webinar RSVP and whitepaper download options as additional incentives to prospects who aren’t quite ready to commit to a demo. 2. Lead nurture. After a demo, prospects receive a series of five emails reinforcing the Iris value proposition and encouraging them to buy. The first email covers Iris’s overall value proposition while subsequent emails touch on specific value prop pillars like PR measurement and relationship management. When a prospect fails to purchase after receiving all five emails, the rep is alerted to reach out by phone. After that, the prospect is moved into a long-term nurture sequence that includes monthly product updates, value-added content, and occasional offers. 3. New customer. Iris is a powerful platform for PR management. And with great power comes great responsibility … to train. Upon purchase, account ownership shifts from the sales rep to a customer advocate from whom a series of offers to schedule free training sessions is sent. Again, this is all zero-touch thanks to Infusionsoft and AppointmentCore. After customers complete their training sessions, they receive a series of 12 emails with tips and best practices for getting the most out of Iris. Of course, these emails link back to the Iris resource center to really help customers get up to speed. Marketing automation helps startups scale. We worked on lifecycle marketing at Bulbstorm. However, due to the technology limitations of the past, the effort was laborious and expensive. It wasn’t automated. It couldn’t scale. Now, as an independent marketing consultant, I get the chance to implement automated lifecycle marketing campaigns that really scale sales and marketing for startup clients like Iris.